Self watering planters reduce the frequency of watering tropical plants. A reservoir built-in to the bottom of the container holds a limited supply of water. As soil dries out, the water in the reservoir is drawn up into soil, keeping it moist. This plant container is a perfect solution for gardeners-on-the-go! Self Watering Planters – What Are The Advantages? Make container gardening easy by reducing the amount of time you spend watering plants. Self-watering planters allows you to take a vacation or business trip without making arrangements for someone to water your plants. These plant containers are available in lightweight materials that make them easy to move. A liquid fertilizer can be added to the water in the reservoir. Self watering pots keep soil moist and tropicals healthy. They make container gardening easy by reducing the amount of time you spend watering your plants. Take your time when making a selection. There are many styles and materials to choose from. Knowing your requirements before you start shopping will save time, prevent frustration, and best of all, save money. Determine the location. Many self watering planters are lightweight, making it easy to try out different locations. Choose a material that will complement your landscape as well as the style of your home. Caring for planters properly will keep plants healthy and ensure the container lasts as long as possible. While these planters reduce the frequency of watering plants, watering chores are not eliminated. Remember to check the water level in the reservoir. Liquid fertilizer can be added to the water in the reservoir. Fertilizer solution might need to be diluted. Proper drainage is important for plant health, so be sure the container has a drainage hole. 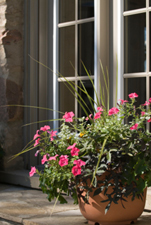 Plastic planters exposed to direct sunlight and extreme heat can become brittle and are prone to cracking. Plastic planters might need to be replaced after 2-3 years. Mosquitoes are drawn to standing water. Add a couple of drops of oil to the water if you notice mosquitoes breeding in the planter reservoir.